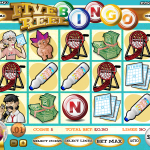 Five Reel Bingo was released in 2011 by Rival. This might be confusing to some because what exactly is a five reel bingo? either it is a bingo game or it is a slot game… but both?? 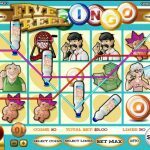 So Five Reel Bingo is a five reel and twenty paylines slot incorporating the rules of Bingo in it. offering with the famous game of Bingo as it’s heart. Bingo is a pastime similar to keno in which the aim is to cross off all the numbers on your card before anyone else. The main symbols here are a pile of cash, Bingo cards, a marker pen, the ball cage, the caller, an old lady with a winning card and (for some reason) a little troll doll. The letters ‘B’, ‘I’, ‘N’, ‘G’ and ‘O’ appear on reels one to five as bonus symbols, the wild is a ball marked with a star and the scatter is an elderly man. The free spins scatter is the Old Man symbol. Landing 3, 4 or 5 of him will bring you 5, 10 and 20 free spins while all wins come with a 3x multiplier. The Bonus Round is triggered when you land all 5 letters to form the word BINGO. You will then be taken to an automated round. The Wild is the Star Ball and it can replace any symbol to form a winning combination. The Jackpot Symbol is the Old Lady and landing 3, 4 or 5 of her will win you 50, 150 and 1500 respectively. This game is a pretty simple game to master. 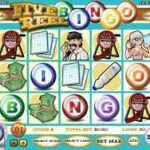 It is not one of the most enjoyable slot game out there but… so is Bingo so what can you expect? To make things even more disappointing the RTP stands at a low 92.1%. You want playing something a bit more engaging? Try playing Fast Lane a 5 reel slot by Rival.